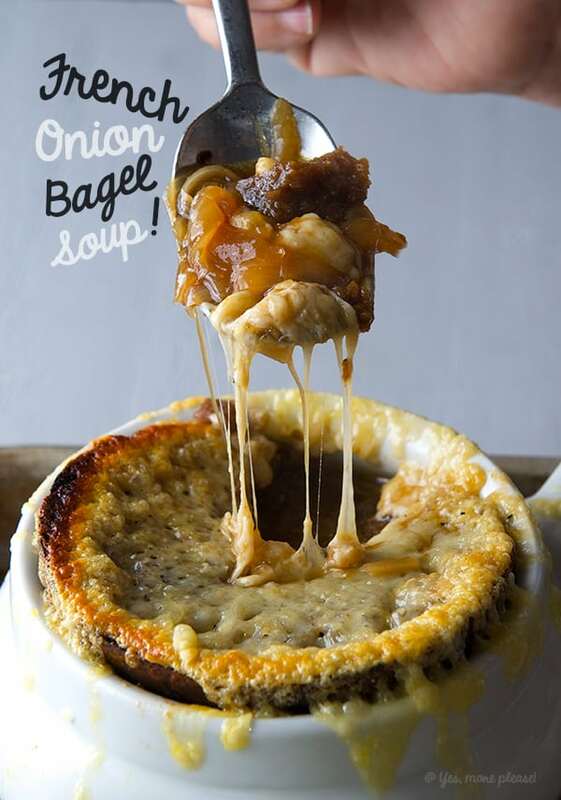 French Onion Bagel Soup ~ Yes, more please! 1/2 cup extra dry Vermouth or any dry white wine of your preference. 4 cups Beef Broth sodium free* I like to use sodium free if store boughten. 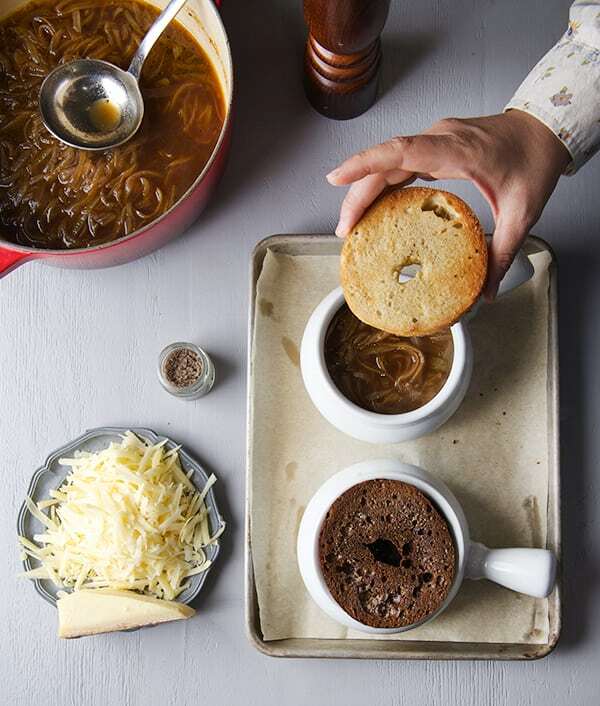 1 teaspoon kosher Salt or Salt de Fume to give an extra layer of flavor. 2 Pumpernickel bagels cut in half . Sliver the closed end on each half to expose the grain of the bagel, and toast. I choose Pumpernickle Ian choose Onion! any flavor that rocks your boat will work. 2-3 oz per person of Gruyère cheese shredded. Buy the real deal, the imported one. I used a Swiss brand with a lot of earthy and nutty notes, it melted beautifully leaving a great crust. Go the extra mile its worth it. If you do not care for Gruyère, try some French variations like Comté or Beauford. 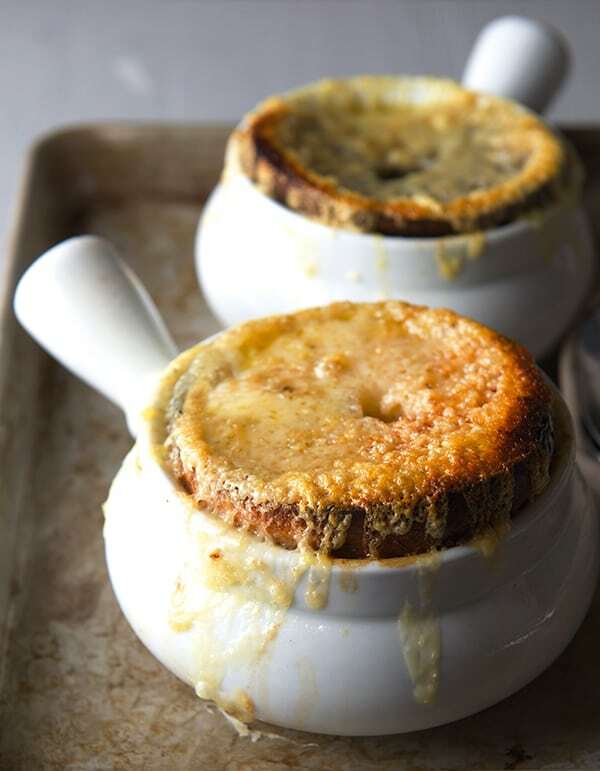 1.One of the most important things to remember when making onion soup its how to cut the onions.”Cut the onions in segments”. Against all french techniques on how to cut an onion, remove top and bottom, cut in half-length wise peel the outside coarse layer, then flat surface down facing the board, and slice lengthwise radially like thin orange segments about 1/4″inch or little less. See photo below. This step for me its crucial to make sure you don’t have onion mush as they caramelize and cook. 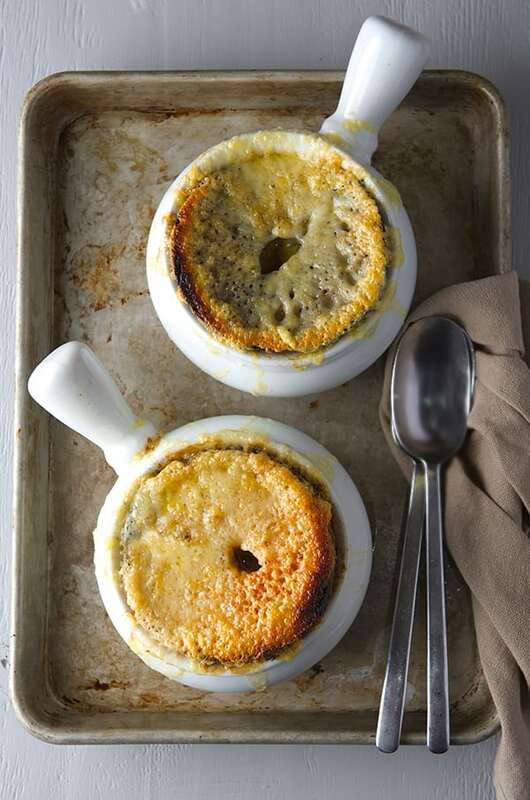 Each segment stays soft and creamy with out disintegrating while soup its simmering away. I also like it this way so you don’t have long stringy slippery onion strings. 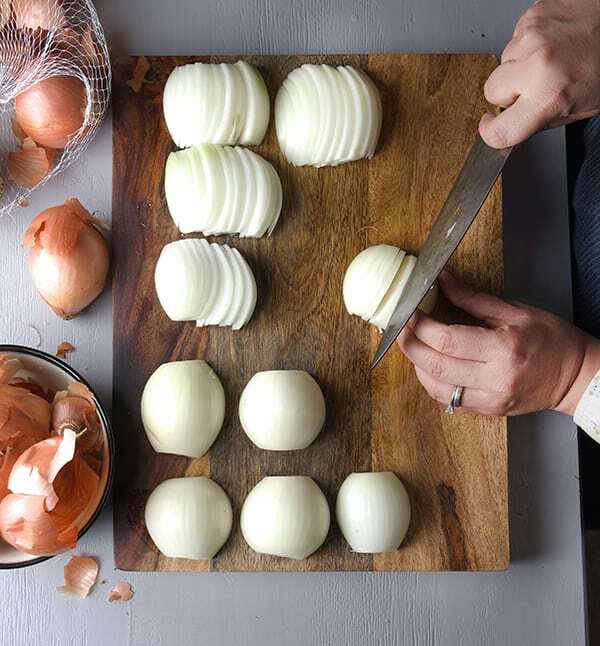 Chose small to medium size onions, they are sweeter and friendlier on your spoon when eating. 2. Chop the onions, following the instructions above. 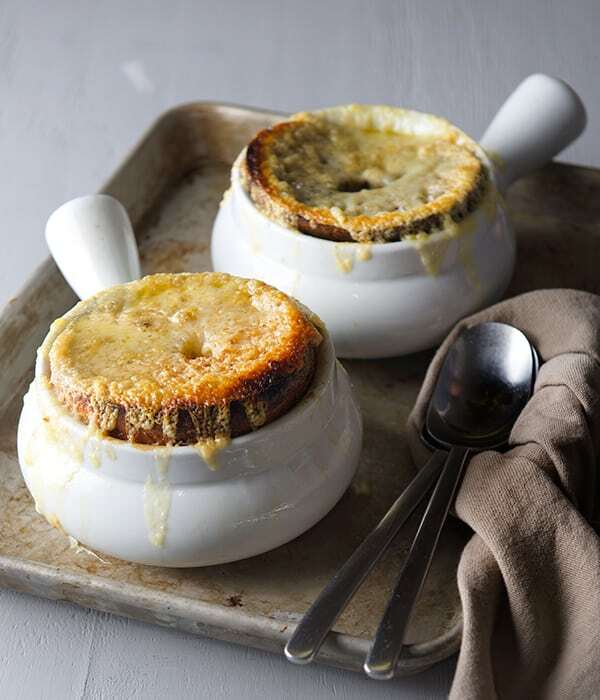 3.Bring to a medium heat a cast iron enamel pot, add butter and a glug of extra virgin olive oil. Add the sliced onions making sure to separate all the segments with your fingers. Toss carefully, lower the heat to medium slow, cover and cook for 10 minutes. Stir now and then. 4. Remove lid and stir; crank up the heat to medium high to evaporate most of the moisture, cook for 3-4 minutes stirring now and then to avoid onions from burning. You want to caramelize them. To help them caramelize add a tablespoon of Balsamic vinegar at this stage, and cook for another 5 minutes or until they look soft, and have develop their sweetness and they have a deep golden brown color. 5.Once the onions are caramelized, evenly sprinkle one tablespoon of flour and toss for 2 minutes scraping the bottom of the pan. 6. Add the Dry Vermouth the sherry vinegar, toss and let the alcohol evaporate. 7. Add the beef broth little by little stir constantly. Then, add Worcestershire sauce, aromatic dry herbs, salt and pepper. 8. Simmer for 25-30 minutes until the onions taste and look soft and they have absorbed the flavors from the broth. Taste and adjust for salt and pepper. 10. 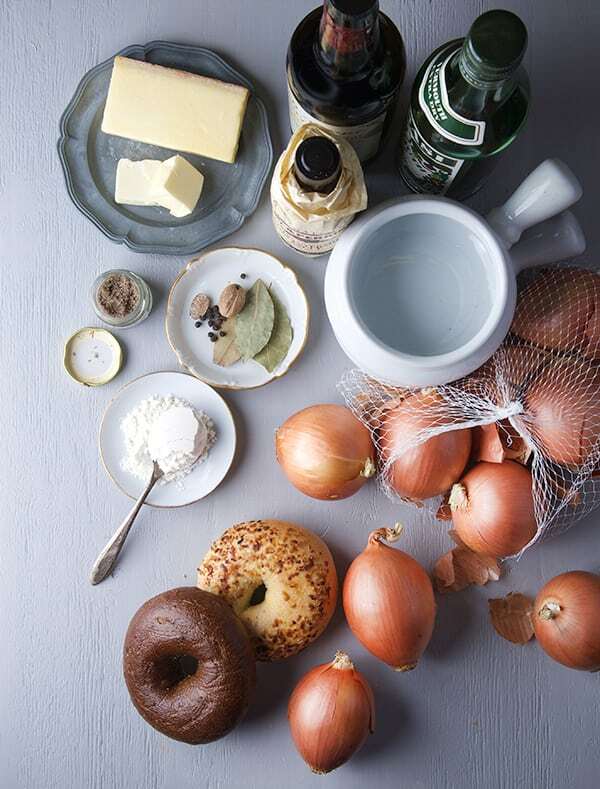 Then place half a toasted bagel into each bowl and top each with 2-3 ounces of the shredded Gruyère cheese. Crack some black pepper and place under the oven broiler for 3-4 minutes until cheese is melted and its crusty and golden brown. Watch at all times they can burn on a blink of an eye! 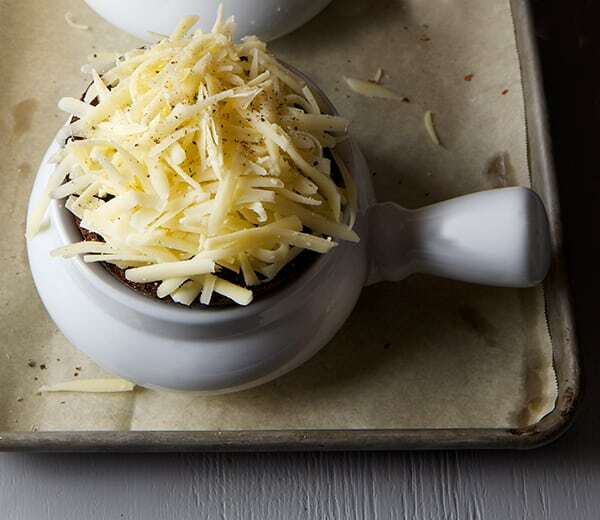 Pull the tray out of the oven and place the bowls on an under plate before serving. 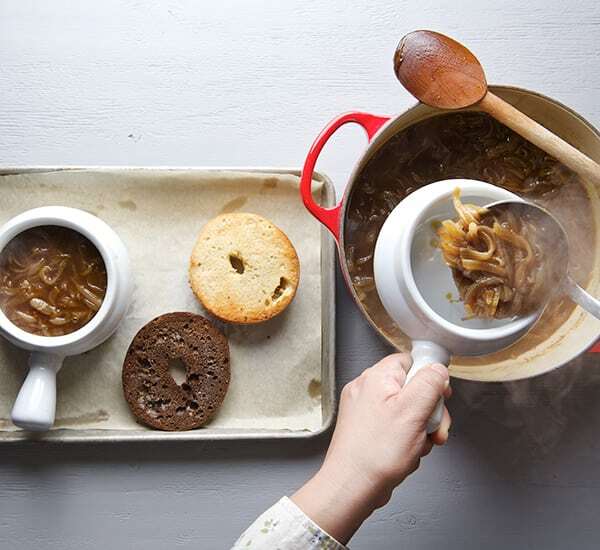 Warn your guests for HOT bowls and extra hot soup. Our Texas dream night winterland … Enjoy!